The most popular superhero and his arch enemy are back to continue their fight in a video slot setting. The epic fight between Batman and Catwoman this time brings even four progressive jackpots with the life-changing prize of $1,000,000. Branded new slot from Playtech is based on the TV Show and uses the pictures and scenes from the cult series. 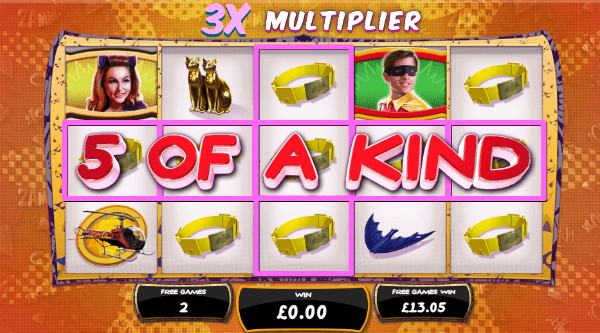 This 5 reel 25 payline slot will be more light-hearted than we might expect from a Batman-themed slot, owing to the comical character of the TV Series. Nevertheless, the bonus features are all but taken lightly. There are serious winning opportunities in Gotham City. Great game and a strong contender for Best New Slot 2017. When you spin the reels on Batman and Catwoman Cash you will see the main characters stacked across the reels, while the rest of the imagery includes their gadgets and weapons. The most useful and most profitable symbol will be our hero’s symbol which is actually game’s Wild and the highest paying symbol at the same time. This means that it can replace any symbol but the Scatter and it will pay 2,500 coins if you find five of a kind on the paylines. The Bonus symbol written in comic-book style appears only on reels 1,3 and 5 to activate the free play. This progressive video slot is playable on all devices from $0.25, while the maximum amount of your stake is set to $2,500. It is only logical to expect a superhero-themed slot to be bursting with action and we can say that Batman and Catwoman Cash lives up to the expectation. Apart from four progressive jackpots that could be triggered randomly at any moment in the game, there are also special bonus games. Batman vs Catwoman Free Games is activated by three bonus symbols. 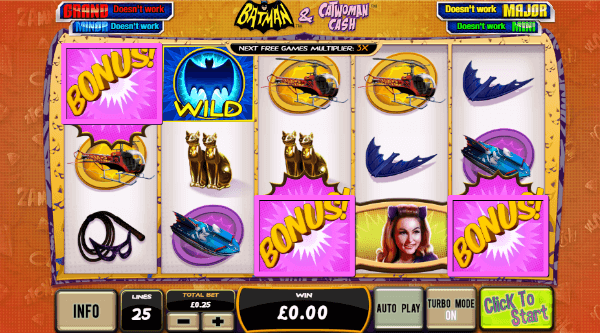 Batman awards up to 25 Free Spins while the Catwoman adds stacked symbols. 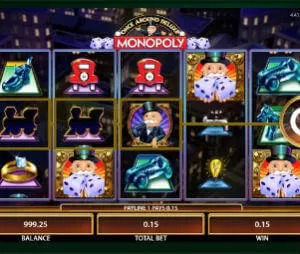 Moreover, the cat lady will add more bonus symbols to the reels once the free play has expired in order to increase your chances of retriggering the Free Spins. Cat Burglar Bonus is sort of a consolation prize for those who fall short of one Bonus symbol to hit the Free Spins. Two Bonus icons will prompt you to pick one of them and award either a cash prize or a multiplier. It is always fun to see popular heroes in a slot game, but the expectations are always high with branded slots. In this case we can say that Playtech does a superb job bringing the popular TV Show to life and adding exciting features to spice up the action behind the main prize of a $1,000,000 jackpot. 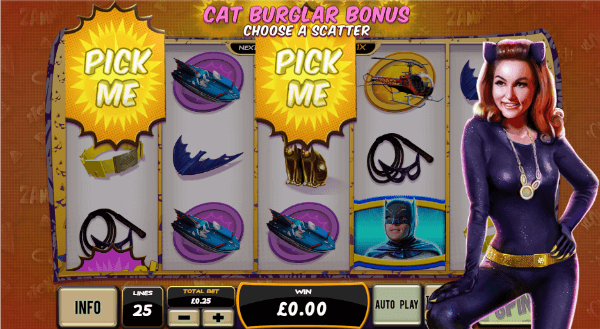 Catwoman will do her bets to help you through the game with Cat Burglar Bonus and extra symbols and multipliers. This is definitely one of the best branded slots we have seen lately.